For groups of 10 or more, please call group sales direct at 561-596-6169 ext. 214. On-line sales will end at 10:30 am day-of show. For additional availability, contact the box office at 561-596-6410. This show is a must -see for any Sinatra fan a multi extravaganza for the eyes and ears! Tony has incorporated video stunning graphics that entice you the moment the stage lights dim and the music begins. The show starts with Sinatra's early days with Tommy Dorsey to the bright lights of New York City to his come back at Madison Square Garden the "Main Event". Tony is uncanny portraying Frank's mannerism and singing voice, will take the audience on a musical journey. It's as if Frank walked off of the screen and on to the stage to perform for the audience. 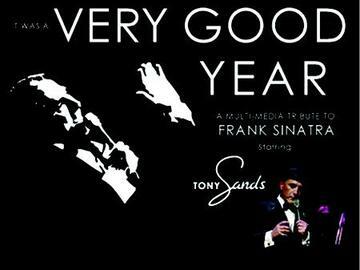 Don't miss this one of a kind musical tribute to Frank Sinatra staring Tony Sands. No Refunds for this event, Exchanges are based on seating availability and are subject to a $5 per seat fee thru the theatre box office by calling 561-586-6410.